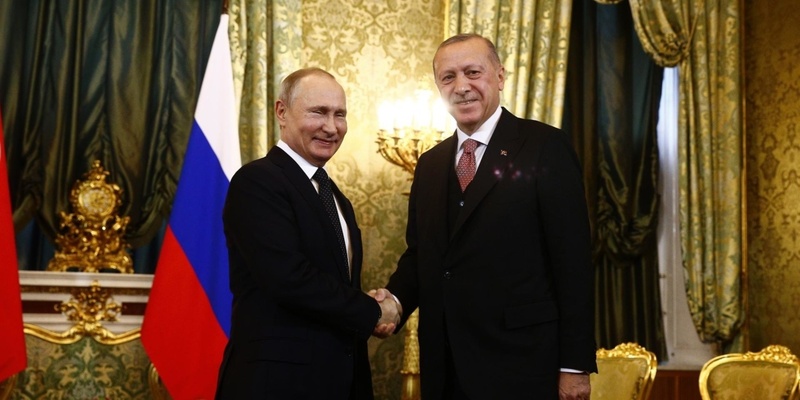 Amid Assad regime attacks breaking their demilitarized zone in northwest Syria, Russian President Vladimir Putin has hosted Turkish counterpart Recep Tayyip Erdoğan in Moscow. The two men said nothing on Monday about the regime shelling, which has killed scores of civilians in Idlib and northern Hama Province, including at least 47 in a 10-day period in mid-February and at least 38 since last Wednesday. Local sources said one of those Turkish patrols was forced to halt last weekend to avoid being caught up in the Assad regime’s bombardment of eastern Idlib. A Turkey military observation post was close to regime shelling of a northern village in northern Hama. Meanwhile, Russia — far from trying to check the escalating attacks — has joined them. Moscow has carried out airstrikes on western Idlib Province, including near Jisr al-Shughour, on the pretext that it is targeting “terrorists”. Russian State media made only passing reference to Syria, preferring to headline Russia’s delivery of advanced S-400 anti-aircraft missile systems to Turkey — an accord that has angered the US. Turkish outlets also focused on the S-400 issue while giving more space to Syria. But his priority was on Ankara’s objective of pushing back Kurdish forces, notably the YPG militia, in Kurdish-held terrority in northern Syria. Ankara will never allow an entity that poses a threat to Turkish and Syrian territorial integrity….On the basis of our common understanding with Russia, we are determined to dismantle the terrorism from Syria that threatens our national security. Erdoğan has proposed a 32-km (20-mile) deep zone along the Turkish-Syrian border which is free of YPG fighters. HTS said that it carried out a retaliatory attack in northern Hama on Tuesday, striking a regime checkpoint with a suicide bomb. The Ansar al-Tawheed group said three fighters killed or wounded 30 regime troops. Local sources said several regime soliders were slain. Assad regime media said the fighters were dressed as local farmers when they approached the checkpoing in Taybat al-Imam about 3 am. A “military source” acknowledged three soldiers died while “all members of the terrorist group” were killed and a tank destroying them was destroyed. Despite the demilitarized zone, regime forces and HTS have clashed throughout northern Hama. The anti-Assad bloc has stepped up its attacks on checkpoints in response to the regime bombardment of civilian areas.